Noting that Dennis Wheeler “has served the AGA with distinction in the capacity as online tournament director,” the American Go Association’s Board of Directors issued a special commendation to Wheeler last week, thanking him “on behalf of the nation’s go players.” Wheeler is retiring from his post as the AGA’s main online tournament director after several years on the job. The Board also issued Wheeler complimentary year’s membership in the AGA for his service. - Stones (free): Play Go with someone next to you. Drag stones from two beautiful Go bowls onto the board. Click here. 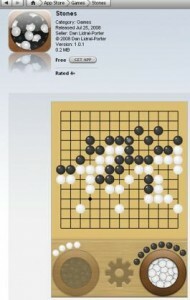 - Tetsuki (free): Play or watch Go on the Internet Go Server (IGS). Click here. - SmartGo touch ($9.99): A full rich-study experience full of options especially suited to stronger players. Click here. - Go Player ($3.99): Geared more toward casual players, randomly chooses from over a thousand games to show which one can either play at a quick pace or slow down and play through move by move by tapping anywhere on the board. Click here. There’s still time to sign up for the upcoming Jennie Shen (left) 2P workshop in Philadelphia. The workshop – which includes lectures and game December 12 and runs through the afternoon of December 14. Cost is $100 for the whole session, or $50 for youth or Penn Go Society members. Check out the Penn Go Society website for details; contact Matt Bengtson(matt@mattbengtson.com, 215-704-4600) or Peter Nassar (pnassar@vet.upenn.edu, 215-898-6271) for more info. photo by Glenn Peters of the Portland (OR) Go Club; click here for more of his go photos. 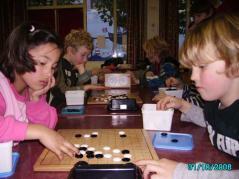 AGA 8 dan Joey Hung has re-opened his go school in Fremont, California. Joey’s Go School – which shut down in August 2006 when Hung decided to focus on his MBA and investing – is located at 114 Yucca Court in Fremont and is open Saturdays and Sundays from 1:30-5P. Contact him at egogames@yahoo.com or call 510-659-8220. XIE YIMIN TAKES LEAD IN HONINBO DEFENSE: Xie Yimin (left) 3P leads 2-1 in her best-of-five-game defense against challenger Suzuki Ayumi 4P for the Women’s Honinbo title. 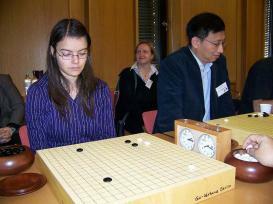 Still a teenager, Xie also holds the Women’s Meijin title. She lost her first title, Strongest Woman, to Kato Keiko 6P back in July, though she made it to the finals, losing 2-0. At this point Kato has the best record in the League to determine the challenger for the Meijin. The fourth game in the Women’s Honinbo title match is scheduled for November 5th. GU LI WINS CHINESE AGON CUP: Gu Li (right) 9P defeated Chang Hao 9P by 5.5 points to win the 10th Agon Cup in China (Ahan Tongshan Cup). This is the third time Gu has won this event, more than any other player. Liu Xing 7P won it in 2006 and 2007, and Zhou Heyang 9P in 2000 and 2004. Gu will play the winner of the Japanese Agon Cup in a dual international meet. The Japanese event has reached the finals, which will be between Takanashi Seiken 8P and Cho U 9P. Gu won this event in 2004 and 2005. Every time he has won the Chinese event, he has also won the match against the Japanese winner. 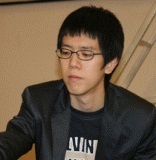 Cho won the Japanese event the last two years and was defeated by Liu both times. KANG DONGYUN VS LEE SEDOL IN CHUNWON: Teen Kang Dongyun (left) 8P, who won a gold medal in the recent World Mind Sports, will play a best-of-five-game match with Lee Sedol 9P for the Korean Chunwon (Japanese: Tengen) title. Last year Kang took the King of Kings (aka Electron-Land Cup) title from Lee Changho 9P by a score of 2-1. Now he has a chance to do the same thing to the other of the two top Korean players, Lee Sedol. It would be quite a feat. Lee Sedol holds four international titles currently and two nationals. Only Gu Li 9P of China comes close to that level; he has two international titles and five Chinese nationals. Cho U 9P may soon have that kind of dominance in national Japanese titles, but holds no international ones. Kang played in the finals of the Chunwon last year, as well, losing to Won SeongJin 9P. SAUL LAPIDUS TOPS ROCHESTER TOURNEY: Saul Lapidus 1D topped the fourth annual Greg Lefler Memorial Tournament , held October 25-26 in Rochester, NY. Thirty-three players from five states and Canada gathered at the Rochester Institute of Technology (RIT) campus. “Two of the winners were deaf players,” notes TD Steve Colburn. Winner’s Report: Dan Division: 1st: Saul Lapidus 1D, 2nd: Phil Waldron 6D, 3rd: Dan Short 3D. Single Digit Kyu Division: 1st: Carrie Lapidus 6K, 2nd: Victor Kostyuk, 3rd: Peter Wynn 5K. Double Digit Kyu Division: 1st: Jesy Felecia, 2nd: Kevin King, 3rd: Brandon Chan. ZHANG REPEATS AT ING YOUTH CUP: Hugh Zhang 6D repeated as champion of the Ing’s Cup Youth Go Tournament on October 26. The 11th annual event attracted 110 kids — including 36 first-time tourney players — to the Chinese Cultural Center of Sunnyvale, CA, where youth ranging from 6D to 30K vied for prizes and trophies. This year, tournament organizers Mingjiu Jiang 7P and Reid Augustin 5D decided to combine all of the 13×13 players into one large division, which Darren Huang won, sweeping all five of his games. Winner’s Report: Division A (Open): 1st: Hugh Zhang, 2nd: Justin Shieh, 3rd: Albert Chen. Division B: 1st: Anthony Su, 2nd: Brandon Lin, 3rd: David Su. Division C: 1st: Daniel Liu. Division D: 1st: Binjih Lin. Division E: 1st: Alex Zhu. Division F: 1st: Matthew Fu. Division G: 1st: Aaron Ye. Division H: 1st: Alan Hwang. Division I: 1st: Kevin Hung. IYAMA FIGHTS BACK IN MEIJIN: Down 2-3 in his challenge for the Meijin, Iyama Yuta (right) 9P came roaring back after losing three straight to make the score 3-3 and take the match to a final Game 7 showdown. Defeating defending champion Cho U 9P by resignation after less than a hundred moves, the teen will now try to ride the momentum in his quest to be the first teenager ever to hold one of the top three titles in Japan. The final game of the best-of-seven-game match is scheduled for November 4th and 5th (U.S. time), and will be carried live on IGS starting at 7 PM Eastern Time on Tuesday night, enabling those interested in the U.S. Presidential election to follow two historic contests. CHO U TAKES FIRST GAME IN OZA: Cho U (left) 9P got off to a good start in his challenge of Yamashita Keigo 9P for the Oza title, winning the first game by resignation. Yamashita is hoping for a three-peat in the Oza, which he first took from Cho U in 2006. Cho had held the title for three years. Yamashita’s only other current title is the Kisei. Cho also holds the Meijin, which he is currently defending against Iyama Yuta 8P, and the Gosei among the top seven, and he is the challenger for the Tengen. Cho will quite likely be engaged in three top-seven title matches at the same time. He is also the current holder of the Agon Cup and the NHK Cup. In terms of current titles Cho is clearly number one in Japan. The next game in the Oza match is scheduled for November 13th.